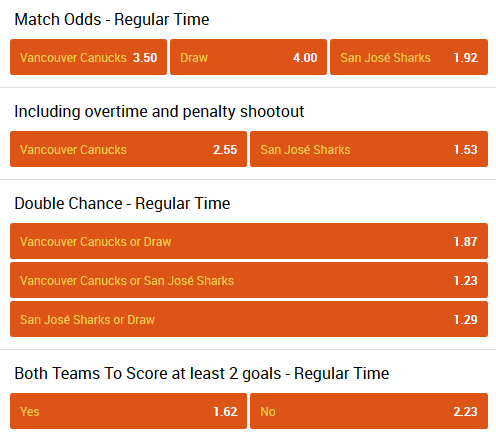 Betting for hockey Vancouver – San Jose. When the weather is bad outside the window, and you do not have anywhere to go, you can always have fun making bets on hockey. This is not only a great way to relax, but also a great opportunity to earn a decent amount of money. Since 1991, clubs have conducted on one ice 129 fights. Vancouver Canucks won in 57 games, San Jose Sharks won in 63 games, and 9 bouts ended with an equal score. Vancouver Canucks spent 71 games in this season, and earned 59 points. But unfortunately the team occupies only 14 position in the West. Vancouver Canucks broke opponents’ resistance in 25 games, and the team lost in 46 games. In five last meetings Vancouver lost to Arizona 1:2, 0:1, Minnesota 2:5, Los Angeles 0:3 and Anaheim 0:3. San José Sharks scored 85 points in 70 meetings. And this is the fifth result in the West. San José Sharks in the current season have a good attack, but with the protection you need to work. San Jose was stronger than the opponent in 38 games, and in 32 games he failed. In the last two battles the club was stronger than Detroit 5:3, and Edmonton 4:3. Vancouver injured attackers Brock Boeser, Sven Baertschi, Loui Eriksson, Markus Granlund, Brendan Gaunce, defenders Chris Tanev, Evan McEneny, Erik Gudbranson. San Jose injured the attackers Joe Thornton, Joel Ward.